Director – Denis Villeneuve, Screenplay – Hampton Fancher & Michael Green, Story – Hampton Fancher, Producers – Roderick Johnson, Andrew A. Kosove, Bud Yorkin & Cynthia Sikes Yorkin, Photography (3D) – Roger A. Deakins, Music – Benjamin Wallfisch & Hans Zimmer, Visual Effects Supervisor – John Nelson, Visual Effects – Atomic Fiction (Supervisor – Ryan Tudhope), Buf (Supervisor – Pierre Buffin), Double Negative (Supervisor – Paul Lambert), Framestore (Supervisor – Richard R. Hoover), MPC (Supervisor – Richard Clegg), Rodeo FX (Supervisor – Sebastien Moreau) & Universal Production Partners (Supervisor – Viktor Muller), Miniature Effects – Weta Workshop Limited, Special Effects Supervisor – Gerd Nefzer, Production Design – Denis Gassner. Production Company – Alcon Media Group/Columbia Pictures/Torridon Films/16:14 Entertainment/Scott Free Productions. Los Angeles, 2049. K86-37, or usually just K, is a replicant that works as a blade runner for the LAPD. K tracks down and retires a replicant working as a farmer in the desert, Examining the scene later, forensics find the buried body of a female replicant and are startled when this reveals evidence that she had given birth despite the fact that replicants are designed to be sterile. K goes in search of the records of the defunct Tyrell Corporation that were lost in The Blackout, learning that this was Rachael. Niander Wallace, the CEO of the successor to Tyrell, becomes interested and despatches replicants to eliminate evidence of the pregnancy. The search meanwhile gives K cause to realise that his memories may not be implants but real and that he might be Rachael’s son. The search takes K to the ruins of Las Vegas in search of the aging Rick Deckard where both of them become hunted by Wallace’s people and the LAPD as they seek to find what happened to Rachael’s child. Blade Runner (1982) is a bonafide landmark film. It was considered a box-office failure when it first came out but its classic stature has become amply evident since then. Its’ gritty, neo-noir and densely teeming cityscapes made a marked break away from the clean white futures that had dominated science-fiction before that and were a key influence on the formative Cyberpunk movement that took off in literature a couple of years later. Indeed, the dark future look came to almost completely dominate science-fiction over the next two decades. Blade Runner, along with Alien (1979) just before it, also made the career of director Ridley Scott. The film exists in an inordinate number of director’s cuts and digitally remastered new versions. The surprise, given the film’s influence, is that nobody has tried to sequelise Blade Runner before this, apart from sf/fantasy author K.W. Jeter who had published three book sequels in the late 1990s. The sequel comes from Denis Villeneuve, a Quebecois Canadian director who has been making films since the 1990s. Villeneuve made his feature-length debut with August 32nd on Earth (1998) and went onto the likes of Maelstrom (2000), Polytechnique (2009) and the critically acclaimed Incendies (2010), all of these in the French language. Villeneuve then moved into the English-language with the strange doppelganger film Enemy (2013) and the abduction psycho-thriller Prisoners (2013), followed by the non-genre drug wars film Sicario (2015) and the highly acclaimed science-fiction film Arrival (2016). Villeneuve has next announced a two-part remake of Dune (1965). Blade Runner 2049 comes with a great deal of respect for and fanservice to Blade Runner. Aside from featuring a key return performance from a now-75 year old Harrison Ford, there is also a one-scene return appearance from Edward James Olmos. Sean Young sort of makes a return appearance, although this is a new Rachael android wherein Young’s voice has been transposed and her younger face digitally recreated over another actress’s body a la Carrie Fisher in Rogue One (2016). The script has also been written by Hampton Fancher, co-writer of the original, while the film is executive produced by original director Ridley Scott. (Scott’s son Luke also directs two of three short films released in conjunction with Blade Runner 2049 that explain what happened between the two films). The film also comes with a great many easter eggs and subtle references to the original – like, for instance, how the opening scene here where Ryan Gosling retires the replicant played by Dave Bautista working on a farm is a sequence that was originally storyboarded but not filmed by Ridley Scott as the opening scene for Blade Runner. Blade Runner 2049 even seems determined to repeat its predecessor’s pattern by also being an expensive box-office failure at the same time as enjoying huge critical plaudits. Even more so than that, Blade Runner 2049 expands out on the themes of the original. We go behind the scenes to see the way that artificial memories are created, see more advanced versions of the replicants. Not to mention that the film offers an ingenious twist on the original that casts a replicant as the central character tasked with retiring his own kind and in the course of the plot his quest becomes one where he begins to ask who he is on a fundamental level. Denis Villeneuve faithfully replicates the Cyberpunk world of the original but also lets us see more of it – notedly travelling outside Los Angeles to show other parts of the world. The same dark and teeming cityscapes are there – even right down to the advertising for Atari, a company that has been defunct in the real world since 1984. The Chinese culture that had permeated the streets of the original has now sits alongside Russian streets signs. One of the core questions that has hung over the various cuts of Blade Runner centres around whether Deckard was a replicant all along and this engages in the same game. A wooden toy horse plays the same kind of role as the origami figures and Deckard’s dreams of unicorns did in the original, something that would seem to bolster the argument that Deckard’s dreams were artificial. On the other hand, the central plot element about Rachael being able to give birth to a hybrid child surely goes with the argument that Deckard was human all along. Denis Villeneuve creates an impeccably beautiful film. The sequel runs nearly three-quarters of an hour longer than the original. It was criticised by some as slow-moving, although I don’t necessarily see this as a bad thing when contrasted to say the modern Star Wars films that are constantly buzzing past their amazing effects scenes by so fast that you cannot take it in. Villeneuve takes far more time to linger over the beauty of the world. He creates majestic shots of spinners traversing and dwarfed by vast cityscapes, squadrons of them in the rain, venturing into the desert. The sets, many of which were built full size rather than digitally enhanced, are stunning – from the halls of records to Jared Leto’s pyramidal inner sanctum as an island in the middle of a pool tranquilly underlit by shimmering light sources, to the climactic scene in a flooding stormwater tunnel. The most dazzling scenes are those that take place in Las Vegas where Deckard lives in the ruins of a casino and we have a fight scene that takes place in a cabaret auditorium while flickering holograms of Elvis, Marilyn Monroe and various chorus girls brokenly play out around them. Amid the rich new panoply of themes that come in in this version is a fascination with simulation. Not just in terms of the replicants but where artificially intelligent holograms play a strong part in the plot. The various modern Star Trek shows probably did far more conceptually challenging explorations of the theme in their various holodeck stories. 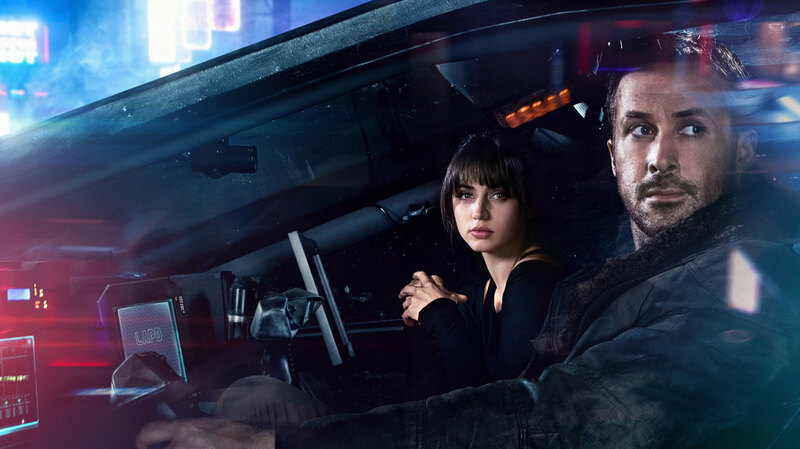 Nevertheless, Blade Runner 2049 turns the hologram towards its own fascinating ends with there being some evocative scenes between Ryan Gosling and Ana de Armas, including one where they dance together on a rooftop even as his hands and raindrops pass through her, or where he takes her as aid during his investigation and she sits superimposed over his face or alternately cuddling and caressing him. Or simply gorgeous shots where Ryan Gosling heads down a walkway as a giant-sized hologram turns to appeal to him. The most evocative scene though is where Ana De Armas coordinates with replicant Mackenzie Davis to create a scene where she can finally make love to Ryan Gosling. The aspect that blemished Blade Runner 2049 for me was the whole replicant pregnancy theme. The idea of humans and machines being able to have babies together is one that turns with surprisingly regularity in science-fiction despite the technological absurdity of the idea – see also works like Demon Seed (1977), Cyborg3 (1994) and tv’s Battlestar Galactica (2003-9). The idea that humans made of biological parts and androids made of circuits can merge on a DNA level is technologically absurd. On the other hand, both Galactica and the Blade Runner films suggest that the machines have become so close to human that they are indistinguishable even on a level of DNA and that this is the next logical step. (To which one might rejoinder that if that is the case then surely what you have is no longer a machine but a biological lifeform. Also if the artificial lifeform has improved on the human, as we clearly see in matters like strength, then that would be detectable medically). In actuality, the whole idea that humans and machines would want to get together and have babies has more to do with anthrocentrism than it does logical machine evolution. It is based around the assumption that machines would consider it the acme of their existence to be able to develop emotions, experience love and from that naturally want to have human babies. Although when the robot revolution comes, you cannot help but wonder when the robots can just go back to the assembly line and build more of themselves with replaceable parts why they would want to incarnate in bodies that have built-in obsolescence and flawed, non-logical aspects like emotions. The film should be notable for its incredibly diverse cast. Villeneuve seems to have deliberately cast all over the world to obtain a mix of actors, ranging from Cuban actress Ana de Armas, Iceland’s Tomas Lemarquis, Palestinian actress Hiam Abbass, the Swiss Carla Juri, Somali actor Barkhad Abdi and Finnish actress Krista Kosonen. The breakout performance of the show comes from Dutch actress Sylvia Hoeks who has a fantastic part as the enforcer for Jared Leto. While she remains overshadowed by Rutger Hauer’s extraordinary performance in the original, Hoeks gives her part a coolly emotionless intensity that holds the screen whenever she is around. 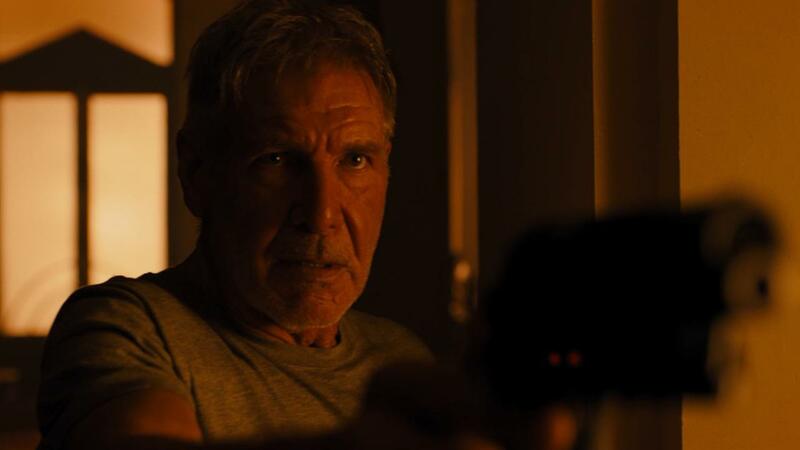 Harrison Ford is back to give a rousing swan song as Deckard. Ryan Gosling meanwhile seems to go through the entire show with a single expression of calm, beagle-like aloofness. (Winner in this site’s Top 10 Films of 2017 list. Winner for Best Director (Denis Villeneuve) and Best Cinematography, Nominee for Best Original Screenplay, Best Supporting Actress (Ania De Armas), Best Supporting Actress (Sylvia Hoeks), Best Special Effects and Best Production Design at this site’s Best of 2017 Awards).